The farm crisis of the 1980s was one of the defining American moments of the late twentieth century. The Midwest’s farmers, long revered as the protectors of America’s agrarian heritage, saw economic reversals of a magnitude unseen since the Great Depression. Many had expanded their operations in the 1970s on the basis of rising land prices, only to see the value of their farms plummet in the early days of the 1980s. Farm income fell significantly, while the number of farm foreclosures skyrocketed. Families began to show signs of stress, as rates of spousal abuse, clinical depression and suicide rose.1 In the face of palpable distress, government agencies and volunteer groups rushed support activities into place. Although it was largely a Midwestern event, the Farm Crisis pervaded the national consciousness, with stories in the New York Times, songs on the radio, and movies in the theaters. The stars of those movies testified to Congress about the passing of a way of life and the pain of the heartland’s farmers. This domestic economic and social crisis captured the interest of the public like no other in the late 20th century. It also changed the rural Midwest, dramatically reducing the numbers of farmers and gutting many a small town. The Midwest that entered the crisis was not the one that emerged a decade later. 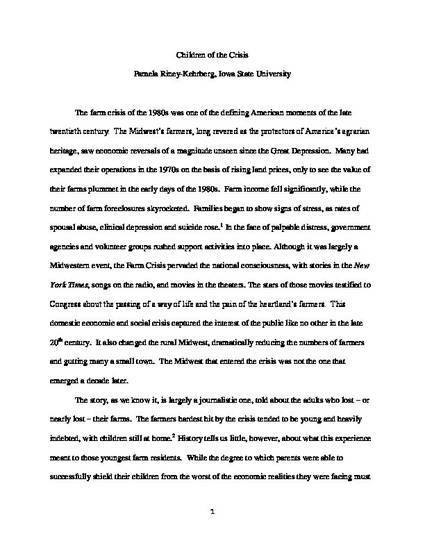 This submitted article is published as Riney-Kehrberg, P., Children of the Crisis: Farm Youth in Troubled Times. Middle West Review; Fall 2015, 2(1); 11-25. DOI: 10.1353/mwr.2015.0049. https://muse.jhu.edu/article/596232 . Posted with permission.